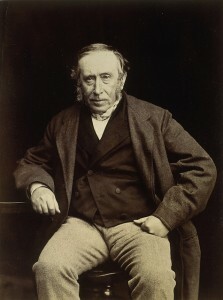 The Scottish surgeon James Syme (1799-1870) has been described as the boldest and most original operator of the end of the pre-anaesthetic era. He was fast and accurate, having begun his career at a period when the ideal operation should take no more than a minute or two. And he was a superb and innovative technician: one of his operations, known as the Syme amputation, is still in use today. He was also, incidentally, the father-in-law of Joseph Lister, the pioneer of antiseptic surgery. A story from The Medical News, published in 1858, reports another procedure invented by Syme and which – in its day – was just as celebrated: total resection [removal] of the tongue. It doesn’t sound much fun. On Saturday, July 31, it being generally known that Mr Syme was to perform, for the second time, excision of the tongue, a concourse of medical spectators was got together such as has, perhaps, been rarely before equalled. I had had an opportunity of seeing the patient a few days before. He was a moderately stout, pale-complexioned man, of about 50. 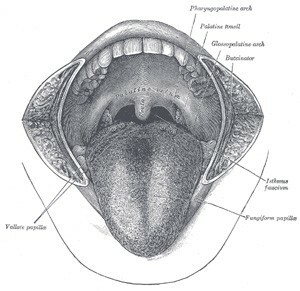 The disease had commenced on the right side of the tongue near its tip, more than two years ago. He was a native of Northampton, and had been treated in the hospital of that town, where, in February last, the cancerous growth had been removed by ligature. After its removal it quickly returned, and the man then sought advice in London. The disease was so much advanced that there could be no doubt as to the diagnosis, or as to the inadequacy of any ordinary mode of operation for its complete removal. The extremity of the organ had been removed by previous operation, and an irregular ulcerated surface now presented itself, behind which was a mass of malignant induration, which involved almost the whole of its substance. The man having been placed under the full influence of chloroform, Mr. Syme commenced by dividing the lower lip and chin in the median line, and, having laid bare the symphysis of the jaw, next proceeded to cut through it with a narrow-bladed saw. The division of the hone was finally completed by a pair of large cutting forceps. The symphysis of the jaw is the groove at the chin (note for pedants: it is not a true symphysis, since strictly speaking the term denotes a joint involving bone and cartilage, such as that between the vertebrae and the discs of the spine). The soft parts below and at the base of the tongue were next divided, the vessels being tied as cut; several vigorous spurts of blood took place, but the whole quantity lost was not large. The two halves of the jaw gaped very widely, and ample room for the manipulations appeared to be afforded. After the section of the jaw, Mr. Syme waited a while to allow of a fresh exhibition of chloroform, the man having partially recovered from its influence. The whole operation was conducted with the patient laid flat on his back, and at times the gurgling of blood in the throat was suggestive of alarm; the man, however, at this stage was not at all deeply insensible. The excision was a most complete one, including the whole of the organ, and all but laying bare the hyoid bone. The chasm left after the conclusion of the operation was very large. Be in no doubt: even today, this would constitute a major and very serious procedure. By the standards of the mid-nineteenth century this was a quite exceptional undertaking. All bleeding was quickly arrested after the completion of the operation, and the man, when removed from the operating theatre, appeared in a very satisfactory condition. On examination of the part excised, a broad portion of healthy structure was seen to extend beyond the margin of the cancer in every direction. Being at the Infirmary on the following Monday, I had the pleasure of learning that the man was doing well in every respect, but I have since heard with regret that he died on the Thursday.